Someday when music critics of the year 2020 look back on the early part of the millennium, their discussion/holo-chat/mind meld will inevitably turn to Interpol, The Strokes, and the rest of the guitar-driven outfits who brought detached cool back to rock and roll. As with the grunge and nu-metal movements before it, the style will probably be broken into the innovators, the pretenders, and the real thing. In that context, consider the Forth Worth, TX-based Burning Hotels as a sort of Screaming Trees of modern post-art rock; they’re certainly doing their own thing and doing it well, even though sometimes that thing is not entirely theirs to begin with. The quartet’s 2007 EP, Eighty-Five Mirrors, bursts with frenetic guitar rock energy, borrowing from the playbooks not only of their reverb-heavy contemporaries, but take it back a step further into some of the quasi-progressive rock touches of fellow Texans …And You Will Know Us by the Trail of Dead and even, arguably, the significantly gentler but equally adventurous Wilco and Radiohead. Yes, the hi-hats are constantly rolling and sure, the riffs are less riffs than they are straight middle-octave power chord progressions, but as with most bands the Hotels’ strength lies not in their innovations but in their conviction; the undeniable swing of the chorus of songs like “Out and Alone” and the opening section of “Stuck in the Middle” offer up irrefutable evidence of a band ready, willing, and able to rock. On the subject of ability (and of rocking), Mirrors packs a remarkably effective punch for its mere nineteen-minute running time. Some of this may be the result of the sometimes winding nature of songwriters/guitarists/vocalists Chance Morgan and Matt Mooty’s compositions, and some might just be the consistently jangly tone of said guitars and the choice of nearly vibrato-free vocal delivery. Mostly though, it all comes back to the rhythm section of drummer Wyatt Adams and bassist Marley Whistler, both adding a slight shuffle to Morgan and Mooty’s more straight-ahead deliveries (most pronounced on the mildly sneering ballad-that’s-not-really-a-ballad “My New Romance”). 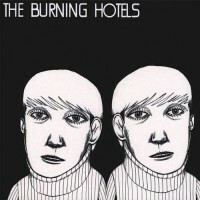 Most bands would theoretically give these songs a more straightforward four-on-the-floor, but Morgan and Mooty’s slight resistance to convention give the Burning Hotels a vitality too many other bands can only hope for. Hyperbole and specifics aside, Eighty-Five Mirrors announces the arrival of band eager to embrace what came before it but also leave their mark on a style they know they didn’t invent. They probably won’t change the world, but Mirrors proves the Burning Hotels are mightily capable of rocking it.